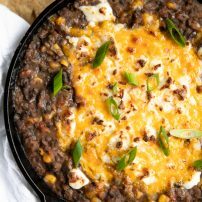 This Easy Black Bean Dip Recipe is loaded with hot and gooey cheese, sweet corn, green onions, and juicy tomatoes. 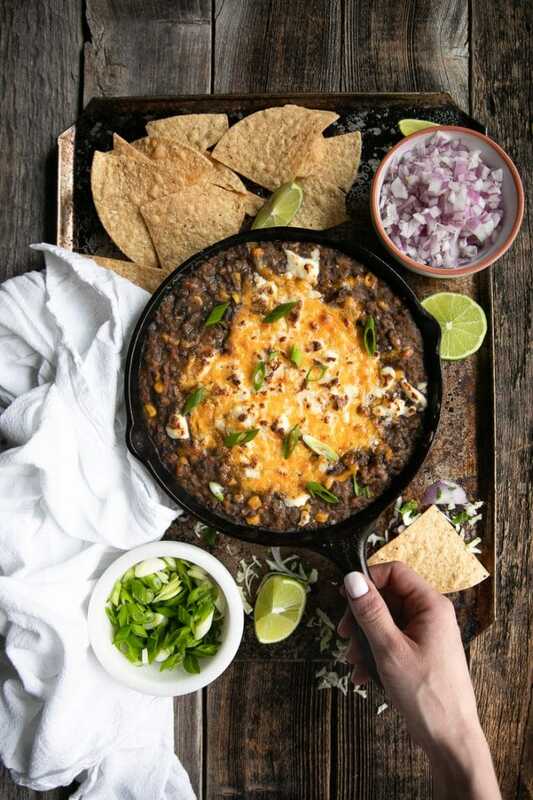 Made with your favorite homemade or store-bought refried black beans, this delicious black bean dip is perfect served alongside your favorite Mexican dishes or at your next backyard bbq. After making these homemade refried black beans I was left feeling inspired. 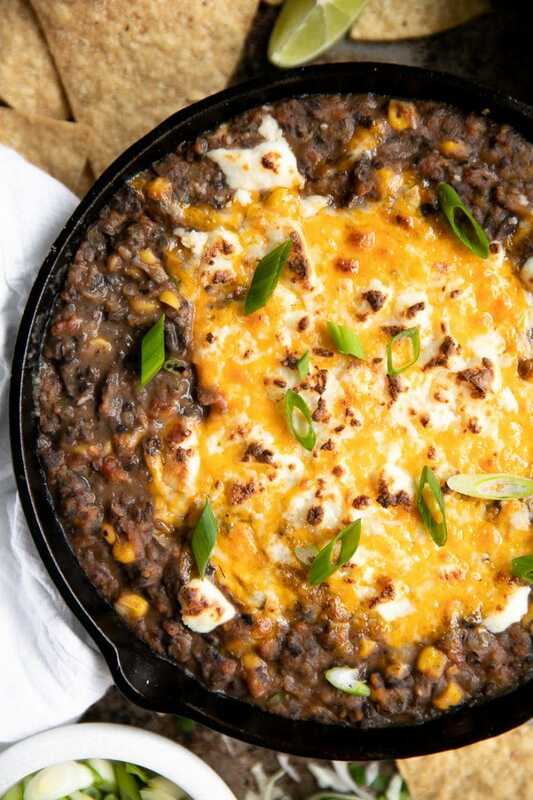 Plain black beans and refried black beans are good, but cheesy baked black bean dip? It had to be done. Besides, what else would I want to do with the cans of black beans sitting in my pantry? Actually, many things. For example, these Roasted Butternut Squash Tacos with Chipotle Lime Crema or these Mexican Street Corn Tostadas with Chipotle Black Beans. But, for the sake of dramatics, let’s just say that for today at least, this black bean dip is the only thing you want to make. Anyway, if you love black beans and cheese, then I’m fairly positive that you’ll love this black bean dip recipe. I have prepared this dip several times and it keeps getting better and better. Fair warning,- once you start dipping, you may not be able to stop! Preparing this black bean dip can be as simple or as involved as you want. You can use one pan, two pans, two pans plus a blender…You see where I’m going. 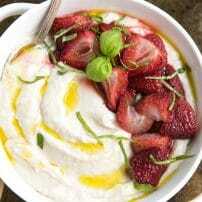 If you want to make this exact recipe, the instructions are detailed in the recipe below. But, as always, I like to give options. To prepare this recipe, I cooked the onion, garlic, tomatoes, cilantro, spices, and drained black beans in a cast iron skillet until everything was cooked and hot. I then used a large spoon to gently mash the black beans, breaking them up. This method creates a chunkier black bean dip. If you prefer a super smooth bean dip, or the smashing with a spoon seems too tedious, you can always blend the mixture in a blender or food processor. Rather than mixing the cheese directly in with the black beans, I decided to top them with two different kinds of cheese and bake. Whichever method you choose, it will taste the same. There are so many different reasons why this dip is pretty awesome. Here are a few of my fav faves. Everyone loves it. I have yet to meet a person who did not enjoy this black bean dip. Of course, dietary restrictions may prevent someone from diving into this dip, but for everyone else, they just can’t stop. And that, my friends, makes me very very happy. You can easily prepare this dip ahead of time and reheat just before the party starts. On that same note- leftovers are fantastic! It’s not just for chips. This black bean dip is tastes delicious piled on tacos, salads, or even wrapped in a tortilla for an easy, on-the-go lunch. 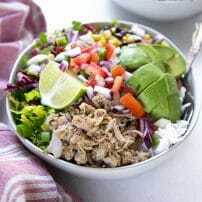 Since not all of us love the same things, I always like to throw out some fun and easy ways you can customize a recipe so that it is perfect for you. Take it or leave it. aka, add the additions you love and leave out the rest. You do not have to add the cilantro or the onion. That said, I highly recommend the corn. If you like corn. It adds a sweet element to the saltiness which is always awesome. Where’s the heat? I don’t know! JK, I intentionally left out any spicy heat since I wanted the kids to eat it. If, however, it were just us grown-ups gathered around this skillet of beans and cheese, I would have absolutely added a jalapeño or some cayenne powder. The cheese is important…but only if it’s important to you. 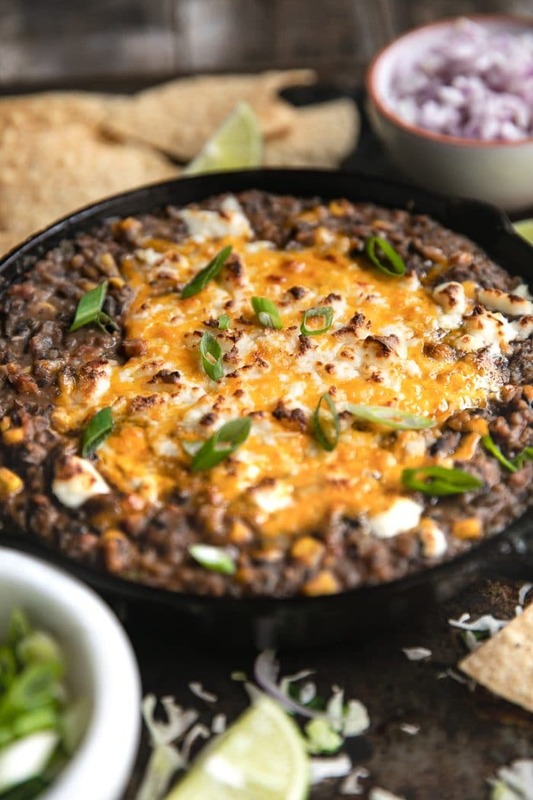 You can leave off the cheese and this black bean dip will still be delicious AND vegan! However, I am a person who loves cheese, so the cheese had to be done. I am also a person who is quite literally obsessed with Casero Cheese. I highly recommend that you put it on EVERYTHING. Preheat oven to 450 degrees F. Drain and rinse black beans. Set aside. Heat an 8-10 inch cast iron (or other oven-safe) skillet over medium-high heat. Add the olive oil and onion and sauté for 3-4 minutes, stirring frequently. Add the garlic and sauté for an additional minute, stirring constantly. Add the diced tomatoes, cilantro, corn, chili powder, cumin, salt, and pepper to the skillet and mix well to combine. Sauté for 3-4 minutes. Add the black beans and use a large spoon to gently smash the black beans, breaking them up slightly. Continue to cook until entire mixture is heated through. Remove from heat. Sprinkle the cheddar cheese and casero cheese over the top of the black bean mixture. Transfer skillet to the oven and bake for approximately 5 minutes or until cheese is melted. Sprinkle with fresh chopped green onions and serve with chips, veggies, or fresh bread. Enjoy! 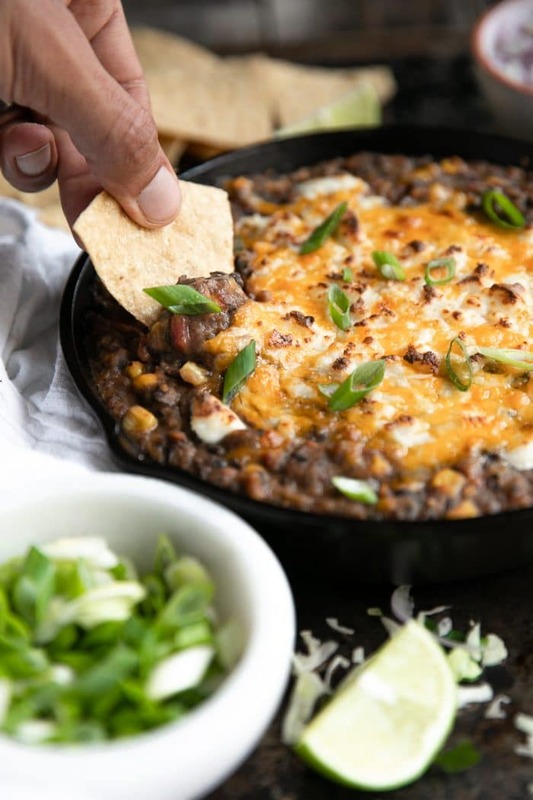 Want to try this Black Bean Dip Recipe? 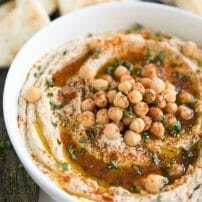 to your Appetizer or Mexican Food Boards on Pinterest and save it for later!